In this lecture, Professor Donald Kagan examines the developments that took place after the Greek victory over the Persians in 479 BC. He argues that even after the Greek victories, there was great fear amongst the Greeks that the Persians would return to seek revenge. For this reason, many of the Greek poleis, especially the islands, looked to Athens to lead this league, which later became the Delian League. Athens, according to Professor Kagan, accepted this responsibility, since it too feared a Persian invasion, but Sparta was content to retreat into the Peloponesus. Finally, Professor Kagan intimates that this league would eventually turn into the Athenian empire. 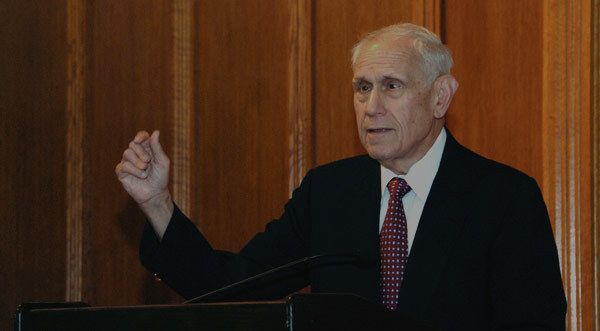 Professor Donald Kagan: The Persians were busy with other things as well as thinking about returning to Greece because the great king was not willing, and understandably in a way, to accept his defeat by these few puny Greeks, because of the consequences that would have for the reputation of Persia, and just as a matter of personal honor these kings would not have been glad to accept such an outcome. I won’t drag you through the details of the invasion by the Persians in 480. After all, we’re making you read Herodotus, and the whole problem about it. But let me simply talk a bit about the conclusion to the great invasion, the great Persian Wars, as we call them, and also to say something about what their meaning was. Another consequence of the war was a division within the Greek world that was in part based upon the fact that Athens had come on in that war to become a great power and by anybody’s reckoning had played one of the leading roles in the victory. Now, the Spartans had too; the Spartans were the official leaders, and their regent had been the commander at the great land battle at Plataea and their general was in charge of the navy, but Athens had become so important, so big, so successful that there was now a question — I mean, was Sparta really the leader of the Greeks? What was the future? Was the future going to be one in which the Spartans would maintain the unique leadership of the Greeks or would the Athenians challenge them? It soon became clear that the Athenians would indeed challenge them, and so a major theme, maybe the major theme in international relations for the next fifty years will be the conflict between Athens and Sparta. A lot of it, I think, could be described really as a cold war, because there is no fighting between the two states between 479 and about 460, or even a little bit later. Actually, they don’t come into conflict themselves until 457 again, and when that war stops there is a period once again of peace, and then we come to the great Peloponnesian War which dominates the last third of the century. That’s all in the future. But what’s clear now is that there’s got to be some new arrangement, some new alignment to face up to the change in the power structure. There was only one great power before the war; there clearly are two after the war. Well, the Greeks also had to decide certain questions that had been created by the war. One of them, who is to be the leader if there is to be a leader of the Greeks, but beyond that there was some Greek states that had gone over to the Persians in the course of the war. The Greeks refer to these people as Medizers. What should be done with the Medizers? I’m sure there were proposals from one extreme that would have said just wipe those cities out to the other extreme which would have said, well, let bygones be bygones. And there were opinions all along the middle of the way, and so that remained an issue that had to be settled somehow. Then behind it all was the question, what shall we look for in the future? Was Persia going to be a threat once again, which would imply one whole set of policies, or can we consider the threat from Persia finished so that we can go back to our normal way without adjusting to that policy? For the reasons I’ve already indicated the Spartans and the Peloponnesians were more likely to take the view that the threat was over. The Athenians, the islanders, and the Ionians, I should said the Asiatic Greeks, would take the view that no, there is a very imminent danger from the Persians, the war isn’t over, we need to continue to fight it. Now, let me then try to describe the way in which a new way of dealing with the Persians would come onto the scene. For that I need to take you back to 481, the year when Xerxes started his march from the Persian empire against the Greeks. The Greeks knew this was happening and they met, you will remember, at Corinth in 481 when those thirty one cities came together and swore that they would fight together to defeat the Persians. They appointed Sparta officially as the hegemon, the leader of that league, which meant that the Spartans would be in command on land and sea and once the battles commenced they would be in charge. But, of course, the decisions as to what to do, where to go to fight, when to fight and so on, were made by the council of Greeks who were participating. The Spartans did not attempt to impose their wishes at that point, So, the league really functions like a league of equals, but of course, the states are not equal in their power so that there’s much more influence by the Spartans, but there’s also a lot of influence by the Athenians, because of the size of their fleet. That’s the way things were working in the Greek League against Persia. Even though the Spartans are the hegemon, they do not confuse this league with the Peloponnesian League. It is something quite different. I’ve already described the league to you and so you know that the relationships are different, and the membership is different. The Greek League has states that are not in the Peloponnesus and have not previously been allied to Sparta; it also includes Sparta’s traditional Peloponnesian allies. They swear this common oath; the Greeks are to fight for the common freedom, to free the Greeks in the islands in Asia Minor. And it is to be a perpetual league, as we know, because as late as 461, I guess, when there is a conflict between Athens and Sparta, the Athenians, in fact, withdraw from their alliance with the Greeks under Spartan rule. So, that tells us that until then they felt themselves still to be part of that Greek League. They agreed in 481 to put aside the quarrels that they may have had at the time, and to have the same friends and enemies, the famous clause that means a common foreign policy. But it doesn’t mean, again — just because the Spartans are hegemons doesn’t mean the Spartans will determine that policy. The policy will be determined by the league in its own meetings. It is to be a typical Greek alliance. The Greek word for that is symmachia; it means an offensive and defensive alliance. I will fight along your side, not only if you are attacked, but if you go to war against somebody else at your own discretion, I still am bound to be your ally; that’s what a symmachia is. So far as we know, that’s the only kind of international alliance that the Greeks knew up to that time, offensive and defensive. Nothing is said about money; there is no provision for providing funds for the league. I think that implies very clearly each state would pay for its own forces when they were engaged in the common cause. There was no provision for regular meetings; meetings would be held when they were thought to be necessary. Of course, everything would have to be done by the common consent. I don’t mean that there was a need for unanimity, but there certainly would have to be a general agreement of things for the game to go forward. This is a new thing. It’s an innovation, and of course it fits in nicely with what I said a moment ago about the concept of panhellenism coming forward. This is the first Pan Hellenic expedition, I suppose since the Trojan War. Now Sparta, as you’ve seen, when the decision had to be made as to whether they should commit themselves to defending the islands with a kind of a permanent force out there to do that, the Spartans withdrew. Nothing is formal; there’s no change in the arrangements, but they just decided to go home. Now we see that the Athenians will be pursuing a different policy — the one that was ultimately adopted by most of the Greeks, but which allowed the Athenians to come forward and make the kinds of claims for their influence that they would. One of the first things the Athenians wanted to do, and I remind you, that the Persians had marched into Attica, and done fearful damage to thepolis of Athens and had done great harm to the city of Athens. They had gone up to the Acropolis, destroyed the temples that existed there, a terrible sacrilege from the point of view of the Athenians, and they wanted to do what they could to see this would never happen again. So, they undertook to build the walls around the Acropolis stronger than they had been, and also to make the city walls stronger than they had been. Now, it’s an interesting sign of the way some of the other Greek states felt that when the Athenians set about building their walls there were complaints from some of the Greek allies to the Spartans that the Athenians were doing this and saying this was a bad idea. My guess is that the complainants would have included such cities as Thebes, Megara, probably Corinth; Thebes and Megara being both neighbors abutting on Attica and old enemies of the Athenians and the Corinthians being just next door, so to speak, not quite on their border but also a state that was undoubtedly challenged by the emergence of Athens as a great naval power and a great commercial power. Corinth had had one of the biggest navies, and Corinth, for the longest time, had been a great commercial power. The archaeological evidence is that it was being challenged in the latter respect by the Athenians as early as in the sixth century. So, these are the kind of states that would have been complaining and thinking that if the Athenians had a walled city that they could defend, it would make them more confident and possibly more aggressive and more trouble for their neighbors. In the war, the Athenians had shown an astonishing, daring, especially at sea, which obviously was making some of their old enemies and neighbors nervous. Well, the Spartans heard about it, and they heeded their friends complaints enough, so that Themistocles who was — I need to point out to you, though I’m sure you know it, emerged from the war as the great hero. He had done so many wonderful things. He was responsible for the Athenian navy, he was responsible for the decision to fight at Salamis, he was responsible, people believe, for the victory at Salamis. We hear as Plutarch tells wonderful stories about in the Olympic games right after the war, people were watching the games when Themistocles arrived, they stopped watching the games and they watched Themistocles, because so great was the admiration and wonder that he created. I always try to figure out some analogy now but I can’t. If you imagine if you could wrap up Roosevelt, Churchill, and Stalin and make him one person after Second World War you might have something like Themistocles did. So, Themistocles goes to Sparta, and he, of course, is the main champion in Athens of Athens rebuilding its walls as fast as possible, and Athens taking the most forward position possible in the navy at sea and in international relations in general. He does this little trick that Thucydides describes. He says, he will go to Sparta, but the Spartans are to send some people to Athens too, and then he tells the Athenians to hold those Spartans there until he gets home. The next thing he says is, let me know when the walls have been built high enough to defend. So, he goes to talk to the Spartans, the Spartans says we hear you guys are building walls around there. You know, I know it’s your own business but we don’t think that’s a good idea, because if the Persians come again they could use your walled city as a base against us. Now, if you can follow that kind of reasoning you’re sharper than I am, but anyway that’s the story they told. Themistocles says where did you hear that nonsense; we’re building walls? What a lot of baloney; forget about it. I’m sorry. I haven’t told the story quite right. He says, look don’t take my word for it, you send an embassy to Athens and take a look; that’s when he told his friends keep those guys there until I get home. So one day, a messenger from Athens comes to Themistocles and tells him, okay the walls can now be defended, whereupon Themistocles says to the Spartans, you know those walls you were complaining about, you were right; we do have them and they’re now big enough that we can defend ourselves against them, and what are you going to do about it? Then he delivers a speech, which is a kind of a declaration, not so much of independence as of equivalence to the Spartans. His message was, we don’t take orders from you; keep your advice to yourself, we’ll take care of ourselves, you take care of yourselves. You are not our superiors. We are your equals was the essence of what he said. Thereafter, Themistocles was not so popular in Sparta as he used to be. Indeed, for the rest of his life the Spartans will be trying to do him harm and remove him from the scene, but he certainly achieves what he wants. The Athenians are a walled city, and they have declared that whatever their formal, technical relationship with Sparta might be under the Hellenic League, the fact is they are independent players and they’re going to do things as they see fit. Thucydides says the Spartans accepted this, but secretly they were embittered. I think that’s the first clue we have to what will become a continuing situation in Sparta for the rest of the time we pay attention to them. That there will be a factional division among Spartans, at least, this much is true. I’m sure it’s much more complicated than we know, but in the simplest way there were some Spartans who were content to withdraw back to the Peloponnesus to have nothing to do with the world outside the Peloponnesus, much less with the world of the Aegean Sea and beyond, and try to return to their traditional ways, a peace faction if you will, a conservative faction perhaps. But that there is also starting now as a result of the victory in the war, a faction of Spartans that would like to exert Spartan power and influence more broadly, at least to include the rest of the Greek states of the mainland, but also a number of them surely felt that they wanted to exert power everywhere, including overseas as well. But that faction, that second faction doesn’t win the argument. They have to be secretly embittered, because the official policy of Sparta is to accept the Athenian situation, and we’ll see in a moment that events move them in the same direction. The commander of the Spartan forces at Plataea, who emerges as the leading figure immediately after the war, is Pausanias, who was the regent, but effectively one of the two kings of Sparta. He goes out to the Aegean Sea — remember the previous king and commander had retired, but now Pausanias takes the fleet and he goes out there, and he proceeds to make the Greeks — first of all, he proceeds to be very effective against the Persians. He does some fighting, particularly in the Hellespont, and the straits in general. Byzantium is a very important city there, what later becomes Constantinople and then Istanbul, and the little town across the way. So, they control the straits, he defeats the Persians and so on, but in the process he makes enemies among the Greeks. Part of the reason is because he treats the Greeks as inferiors, as if they were underlings of the Spartans. In general, it appears to have been a common Spartan problem that when they went out of Sparta and had commanding positions over other Greeks, they regularly treated them in that way — different degrees, of course. Pausanias must have been particularly annoying, but there were main complaints about how they were treated by his Greek allies. In addition, he became very much caught up in the great wealth and luxury that the Persians demonstrated. Most Greeks were, at least theoretically, very appalled at the morals or the lack of morals of the Persians from their perspective. But the Persians were, first of all, very rich and the Greeks were not, and they used their wealth for various purposes all of which were seen to be ungreek and unattractive. Pausanias fell for it and he began behaving as though he were a Persian satrap at the very least. All of these things, as I say, irritated their fellow Greeks who began to bring charges against him. He was charged in Sparta with, first of all, tyranny and then second of all treason. He was alleged to have cut some kind of a deal with the Persian ruler and hissatraps against the common cause. This was effective enough to have him recalled and put on trial. He was acquitted. On the other hand, he was not sent out again to be the commander; he was put on the side. Later on further charges would be brought against him and he would indeed be put to death. Okay, but the main point is that the Spartans have withdrawn their commander, pretty much in disgrace with the rest of the Greeks. They send out a replacement. A man called Dorcis. The allies don’t accept him, and they say no we’re not taking any Spartan commanders these days and send him back home. That is an extremely important step. The allies, and that means now, the people in the Aegean Sea and on its borders, the people who are in what will be first the Athenian sphere of influence and then the Athenian Empire, these are the states that don’t want Spartan rule. I think the main reason is — well, there’s a couple of reasons. One is the behavior of Pausanias has discredited the Spartans, but the other I think is this. Look, how much evidence do you need that the Spartans really don’t like this kind of thing? Remember, they had voted against taking those three islands into the league even back there in 479. And the other thing is that, here are the Athenians, the guys who really won the war at sea, which is the one you’re concerned about and who are apparently ready and waiting to continue to do that. And it was I think that choice that was in the minds of the allies when they sent Dorcis home and said, please no more, and the Spartans did not send a replacement for Dorcis. They, in other words, accepted that they would not participate in the future campaigns against Persia, which would be obviously aggressive campaigns in Asia, since the Persians had been driven out of Europe and out of the Aegean Sea. Thucydides says this about the Spartan decision. They also wanted to be rid of the Persian War, and believed that the Athenians were competent to lead, and were at the present time, well disposed to the Spartans. Why not, they said. We don’t want to fight this war; we don’t really care about those things, and everything will be okay, because the Athenians can do it and they’re our friends. But surely that was not all what all the Spartans thought, that was the opinion of the faction that won the argument, which was the conservative faction, the one that was the peace party and let’s stay in the Peloponnesus party — it was still the predominant force, and I suspect their position had been strengthened by the disgrace brought upon Sparta by the behavior of Pausanias, and no doubt by the rejection of the Spartan replacement by the other Greeks. Why should we force ourselves? We are making ourselves unpopular. It used to be the Greeks came to us and begged us to fight and protect them, when they’re in trouble and now they’re rejecting our leadership. That’s because we shouldn’t be out there. This is not our kind of a campaign. Well, one can go on and imagine the arguments that were used. Now, did this mean that there would be no continuing campaign against Persia? Certainly not; that is not what the allies meant. They turned to Athens and asked the Athenians to take the lead in the war that was going to come. Herodotus has a line in which he says, the Athenians offered the hubris of Pausanias as a pretext for taking over the leadership of the Greeks out there. That suggests that the Athenians were planning to do just that, that they very much wanted too and that they were engaged in maneuvers to bring it about; that it was their idea that they took the initiative. But I think that’s not right. Let me back up a step; it’s only partly right. What is certainly clear is that the Athenians were ready and willing to do what they were asked, but the idea that they either used their power and influence, or their wiles to bring the allies to take that decision, when they would not have otherwise done so, I think that is wrong. I’m going to start doing something that you may get tired of after awhile; I want to use an analogy that I find very illuminating anyway. The analogy of the formation of NATO after the Second World War and the formation of the Delian League, which is ultimately turned into the Athenian Empire after the Persian Wars. In the case of the Delian League, I think a Norwegian or a Swedish scholar has described the process whereby NATO was invented as the establishment of hegemony by invitation. That is, if you look at the situation in 1945, 1946, 1947, 1948, and 1949 the Europeans states that ultimately became part of NATO desperately wanted the Americans to join with them, not to repeat what they had done after the First World War, which was to retreat back into North America, to have no connections of a political military kind with Europe, which terrified the European states that were sort of knocked down so hard by the Second World War and who were afraid that the Soviet Union was going to take them over and they desperately wanted the Americans to take the lead. Now, the Americans were glad to do it. I don’t mean all the Americans, as always, there were factions and differences of opinions and the American President and his government had to fight hard to convince Americans to do it, but by and large they did and those who won the argument were of the opinion that American interests, first of all, in restoring Europe to its previous condition, and secondly, to resisting communist takeover, Soviet takeover of Europe, meant that it was in America’s interest to see that such a situation developed. Both sides, I would argue, were equally glad to see what happened because it was in the interest of both sides. So I think it was in 478-7 when the formation of the Delian League took place. Obviously, the states that were bordering on the Persian Empire and in the seas next to Asia Minor were absolutely at risk, if the Persians came back. Supposing the Athenians had said, we’re not interested and had gone home, just as the Persians had — there was no Greek force except for the poor Asiatic Greeks themselves to resist a Persian return and they couldn’t possibly resist that. So for them, it was a life and death matter, at least it was a matter of freedom versus slavery that they should persuade the Athenians to take the lead. But for the Athenians, who won the argument, it was obvious they felt our needs, for instance access to the Black Sea, our feelings, friendship for the Greeks of Asia Minor, and our fear, fear of what the Persians might do if they got rolling — all point to the same outcome, and so I think both sides were equally glad to undertake this new path. I think we would be deeply mistaken, if we imagine that anybody imposed his will on anybody else in this matter. In fact, the Athenians, according to Plutarch’s story, needed persuasion. Plutarch tells the tale of Aristides, who was in command of the Athenian fleet there off Asia Minor at the time. When the Samians, particularly took the lead and came to the Athenians and to Aristides and said, won’t you please be our leaders? Aristides said, before we do that, you show us that you are really committed to us, and that you will not simply use us. I’m putting in stuff that’s not in Plutarch now. Don’t use us as a kind of a way of convincing the Spartans to stay and then leave us in the lurch. So Uliades, the commander of the Samian navy, turned, took his ship, sailed it against the flagship of Pausanias, this is at the time when Pausanias is still around, and rams that ship. Well, that ought to take care of any possibility of playing footsy with the Spartans, at which point, the Athenians accept the leadership and then move forward with the plan for doing that. So in the winter of 478-7, there is a meeting of the Greeks who are interested, at the Island of Delos. Delos is right smack in the middle of the Aegean Sea, and as I’ve told you, it is the birthplace of Apollo and Artemis, and Apollo, of course, has got a special fondness for the Ionians, and so it’s the natural place for this to happen, and they come up with what amount — it is essentially a constitutional convention. They come up with a constitution that will describe how the league is to work. The aims of the league are that the members of the league will fight against the Persians, first of all, to avenge what the Persians did to the Greeks, and secondly, to collect booty from the Persians to pay for the damage that the Persians did. So, that is a part of the story. I think, of course, implicit, it didn’t have to be said, that the primary motive must be to maintain, establish I would guess, and maintain the freedom of the Greeks from Persian rule. Thucydides doesn’t mention that and some scholars have been misled into thinking that somehow that wasn’t part of the story. Well, how could they do the rest of it, if they didn’t do that? These states were obviously in danger of being taken by the Persians, so the maintenance of their freedom had to be step number one, and surely that was clear in their minds. They agreed, as it was typical, in Greek alliances to have the same friends and enemies, common foreign policy. To carry this forward, they all swore oaths; that’s their form of signing treaties. They don’t sign treaties they swear oaths. Then they dropped chunks of iron into the sea, as a symbol that the treaty was to be perpetual. That is to say, it would last until the iron came up and floated on the surface. They knew that wasn’t going to happen. So, they are a standard kind of an alliance with a perpetual — I need to make the point that most Greek alliances that we hear of in this period are not perpetual. The Athenians and the Spartans in 445 make a thirty-years peace. In 421, they make a fifty-years peace; on another occasion they make a five-years peace; that’s the way they do things normally. This is different. This is like the Greek League; this is a perpetual alliance. The membership of the league, as best we can figure it out — this is not a hundred percent accurate but it’s not bad. It includes — First of all it, uniformally, at this point — divides the league up into zones. One is the islands of the Aegean Sea, and we have knowledge of twenty towns that are members from the islands. Ionia, that is on the coast of Asia Minor itself, thirty six, towns along the Hellespont route into the Black Sea, thirty five, Caria which is the southern coast of Asia Minor has twenty four. Thrace, which is the northern shore of the Aegean Sea in Greek territory is thirty three; comes to a total of a hundred forty eight. If you imagine you’re talking about a hundred and fifty towns, you’ve got the general idea right. So, that’s quite an amazing thing. Peloponnesian League certainly didn’t have anything like that in terms of numbers of states. But don’t be too carried away, because lots of these places are just tiny little spots, especially when you’re talking about islands. Some of the island states in the Aegean and they apparently were just about all members, are very small indeed. Still, it includes some very important states like those big islands I mentioned already Samos, Chios, and Lesbos, and others that were not quite as big, and some states on the Asian side that were old, and big, and important cities, Miletus being one example of it. So, there it is, notice what I have not included. No Peloponnesians. This is not in any shape, manner, or form connected with the Peloponnesian League. I’m going to play my analogy game in a moment too, but what I want to say is you need to — it would be easiest I think for you to grasp what’s going on here, if you think of three separate organizations; first, there’s the Greek League against Persia that was formed in 481 which includes Peloponnesian states and non-Peloponnesian states. Then keep in mind, the oldest of these, I should have mentioned first, the Peloponnesian League, which is older than the Greek League, which includes for our purposes essentially only Peloponnesian states. There are a couple of exceptions, but none are across the sea in any way. Then there’s this new league which we should call the Delian League, although the Greeks referred to it as the Greeks, just as they had the earlier league. But it’s easier to think of it as the Delian League to separate it from that league. Okay, here’s the analogy that I suggest. The Greek League against Persia, we might think of as being like the United Nations Organization, because it includes states from both sides, from all of these places and I think if we think of the Peloponnesian League as one of the subordinate leagues, and the Delian League as the other, in other words, like NATO on the one hand and the Warsaw Pact on the other, that will be a helpful analogy, because, first of all, both of them are members of the Greek League too, and as the United Nations Organization Charter permits regional associations, so NATO and the Warsaw Pact were regional associations, so too without their being any formality about it, it clearly didn’t mean to abolish the Peloponnesian League. Therefore, there was no reason why there shouldn’t be a different regional alliance like that of the Delian League. That, I think, is the structure of the international system in Greece as we move past the Persian wars. Now, let’s say a little more about that Delian League; there are more things you need to know about it. It is a hegemonial league, just like the Peloponnesian League. That is, there is a designated leader. Athens is the designated hegemon of the league, and there is also something quite different, something new, since this is a naval league, it cost money in a way that a military league made up of hoplite citizens doesn’t. So it was clear there had to be some league money, a league treasury. For this purpose, they declared the collection of something they called a phoros. It just simply means, in the most neutral sense, contribution. As time passed, this contribution was seen to be something imposed upon unwilling payers and in English we use the word to describe it as tribute. But let’s think now, for the moment, only about the beginning of the league and what was intended at first. So there is this contribution which becomes the league treasury. The assessor was an Athenian general, Aristides. Aristides the just, as he was known, told each state how much it would be required to contribute. This took the form in the beginning, in some cases, of ships and crews to row them, and in other states from the very beginning, money. Now, I think we should imagine that the earlier you are in the league, the more there are allied ships and crews, and as you get later and later, until finally you’re into the Peloponnesian War, just about every state doesn’t have a fleet of its own, doesn’t supply crews, but just pays money. Again though, I urge you to think about the beginning and not worry about the end just now. So the Athenian assesses that, there is also an Athenian citizen who will be chosen for the job of treasurer of this new league, hellenotamias is the Greek word and he will see to the collection and the security of that money; an Athenian does that too. Also, any military or naval campaigns conducted on behalf of the Delian League will have an Athenian general in charge. Now you know, looking at it backwards, you can say, well, this is Athenian imperialism and the Athenians are imposing their power; no, the allies would have been the first to want to do this because what they were afraid of, just as I think as the Europeans were afraid in the forties, was not that the Athenians would have lorded over them, they were afraid that the Athenians would run away and leave them to their fate. They wanted to tie the Athenians into this new organization. Now, this Delian League is unsurpassed among the few international organizations there are in the Greek world. It was enormously efficient because you had a leader who was designated and interested, and deeply involved. You had an organ for making decisions; I haven’t mentioned it, but there was what they called this synod of the league. It’s the council of league in which there are representatives from every state and it can make all the decisions that have to be made in that one place. Unlike these other places it has its own money, and its own forces, which are assigned to it by the constitution. All of these things make that a much more effective league, able to do what it has to do without any great difficulty in the decision making process, and to make that a little clearer I need to tell you another thing. In the synod, the arrangement was one state, one vote. So, Athens was one member of that synod. Athens, which had the lion’s share of the power, had only one vote. So, how could the Athenians have their way, you may ask. But the way it really worked was, because Athens had all of this prestige and all of this power, it meant all of the very small powerless states huddled under the wings of the Athenians, and could be counted on to deliver the right sort of vote, to do what the Athenians told them, whereas, supposing they had used something like proportional representation, given the Athenians “x” number of votes, a lot of votes, but they would have had to give Thasos and Samos, Chios, Lesbos, all these big towns and islands, numerous votes as well. They would certainly have been more votes than the Athenians had. They could have outvoted them, the Athenians, if they got together. Under this one state, one vote rule, that’s impossible. We never, never hear of any trouble passing whatever the Athenians want in the assembly. There’s just no check on their doing what they want in a constitutional way. Now, so long as everybody’s playing by the original rules this doesn’t really present any serious problems, but as time passes and there are differences of opinion, and as for various reasons, as I will explain, the Athenians begin to assert their power and begin to change the situation, it’s at that point that the question of autonomy will arise, and the Athenians will in fact interfere with the autonomy of the other states, and turn the league ultimately into what the Greeks called anarche, which we rightly translate as an empire, but once again, I don’t want you to think about that when you’re thinking about the situation in 477. It’s in the future, and that’s not what people are expecting or wanting. There is a common interest, and it’s very strong in 477, to deal with the threat of the Persia and to get revenge and payment from the Persians for what has happened. The problem only emerges or problems emerge when the challenge from Persia recedes, and as we shall see, that’s of course was the same problem that NATO suffered from and suffers from today, which is to the degree that they don’t feel threatened by anything, the states that are allied to the United States, don’t feel they have to do what the Americans want, and that’s the way it was when the situation developed in Greece. Okay, that’s the original situation of the Delian League and I want to turn next to the story of how that turns into the Athenian Empire. The first thing I want to indicate to you is that the success of the Delian League from the outset was extraordinary. One little town that was still in Persian hands in 477 was the town of Eion located at the mouth of the Strymon River up in Thrace. The Athenian commander took a league fleet to Eion and drove the Persians out. Soon thereafter — by the way, the dates that we have for this are very insecure. They are mostly derived from the story that Thucydides tells us, the details are very few and he doesn’t give us very many good dates, if any. So, there’s a certain amount of estimation. It doesn’t really matter from your point of view, but I will give you dates that are commonly accepted, but you mustn’t imagine that they’re firmly fixed. Anyway, some years, not too many after the establishment of the league, the league under the great Athenian commander, who will play a larger and larger role in league affairs and also in Athenian political affairs, Cimon takes this force against the Island of Skyros in the Aegean. Skiros was attacked, because it was not inhabited by Greeks. It was inhabited by non-Greek peoples who made their living out of piracy. Well clearly, all the states of the league had a lot to lose from allowing pirates to roam freely in their waters, and so Cimon crushed the Skirian pirates and he drove them from the island, and he made sure that the island would be secure by putting in an Athenian cleruchy. Remember that cleruchy the Athenians put in near Chalkis. This is the same kind of arrangement; Athenians of military age who permanently settle in Skiros, but retain their Athenian citizenship; they are a garrison in effect to protect the island of Skyros from falling into bad hands in the future. It was widely believed, and justifiably, that Cimon and that force had liberated the Aegean Sea. We never hear about piracy anymore; piracy was a problem that the states in the Mediterranean in general suffered from a lot and at different times very, very seriously. One thing that this new league, even when it’s the Delian League and one becomes the Athenian Empire, there is no piracy in the region where that league exists. Then they turn to the city of Carystos, which is at the southern end of the Island of Euboea. The Carystians you remember had, under the greatest military pressure, actually surrendered to the Persians, given earth and water, and so technically they were Medizers and there was no mercy shown to them. They were compelled, they didn’t wish to do this, but they were compelled to join the Delian League, and to pay a cash contribution, not to be allowed to provide their own ships. Thus, almost from the very beginning, there is one instance of a state, which doesn’t fit the general picture I’ve been painting. A state that is a subject state and is compelled to be a member, but it’s just this one case of a Medizing state. Then possibly in the year 470, another development. We hear that the island of Naxos — this seems to be an island full of trouble. Every time we hear of Naxos, it’s getting into difficulty of some kind or another, but they decided that there wasn’t any great threat from Persia, that the Persians weren’t coming back and so they said we’re quitting the league. Well, I’m sure somebody said, don’t you remember, you swore this oath. You threw some iron lumps into the sea. Do you see any iron floating around here in the Aegean Sea? You’re not quitting. They rebelled. The league sent a fleet, and they put down the Naxian rebellion, and Naxos was now reduced from the category of a free ally, making the kinds of contributions the other allies did to another subject state, which paid money. Their walls were taken down, their fleet was taken away, and that’s the pattern that we shall see. States who don’t carry out their responsibilities, states that particularly try to rebel will be treated this way, and their number will increase as time passes. By the way, we do not hear of anybody in the league objecting to these decisions and these actions, nor should we expect to that there would be. The allies still believed they needed this league and they weren’t about to let people get a free ride such as Carystos would, whether they paid or not, the Persians weren’t going to attack them so they ought to pay, or states like Naxos who decided, well, we feel safe enough so we quit. That wasn’t going to be permitted. So in a sense, what you can really see from this is that the league was working, as it was supposed to, to be able to do the job that it had too. Then if the dates are right, in the next year 469, comes a very important turning point in the history of the league. The Persians have a fleet in the — well, you can’t really call it the Aegean, it’s around the corner on the southern coast of Asia Minor, the Eurymedon river flows out there and they had a fleet and an army inland. The league forces went there to the Eurymedon under the command of Cimon, defeated and crushed the Persian fleet at sea, landed and defeated the Persian army on the land, and that was a terrible blow to the Persian position in the eastern Mediterranean. The evidence is apparently that the Persians had to pull back from that entire area and it would not have been at all unreasonable for people to think well, the Persian threat really is over. This is beyond what happened in 479; it’s not just that we’ve driven them out of Europe, we’ve driven them away from the Mediterranean Sea. You could imagine that that’s just the end of the Persian threat. That was not the view taken by the Athenians, or I guess, by most of the allies, but we can imagine that there were some of the allies, who were restless in their need to continue to make contributions to the league when they didn’t feel that there was any purpose to the league anymore. I gave a hint to this earlier. I don’t remember whether General Grunther was the second commander of NATO, but he was an earlier commander of NATO, obviously a West Point man, educated, he knew all about Thucydides and the Peloponnesian War and so he made the analogy — the first time I’m aware that anybody did, between NATO and the Delian League, and he was doing so as commander of NATO at a period when he felt that the American allies in Europe were more and more reluctant to make the kinds of contributions that he thought they should make and was bewailing his situation, which was every time the Russians looked like they were going to behave, then the allies decided they didn’t want to make any contributions, and then when the Russians looked scary, everybody came running and said, sure we’ll contribute and he suggested that’s the way it was in the Delian League too. So keep in the back of your mind that there are real questions out there in the league as to whether it should persist, and we’ll carry this story forward next time. Pomeroy, Burstein, Donlan and Roberts. Ancient Greece. Oxford University Press: New York, 1999, pp. 200-215. Plutarch, The Rise and Fall of the Athens: Aristides, Cimon. Kagan, Donald. “Problems in Ancient History.” In The Ancient Near East and Greece. 2nd ed., vol. 1. Prentice-Hall: New York, 1975, chapter 5. Thucydides, The Peloponnesian War, Book I: pp. 89-117.